Mumbai, January 29: “Disaster Management is an extremely important aspect for achieving sustainable goals and many NGOs are working in hand with administration in this sector. 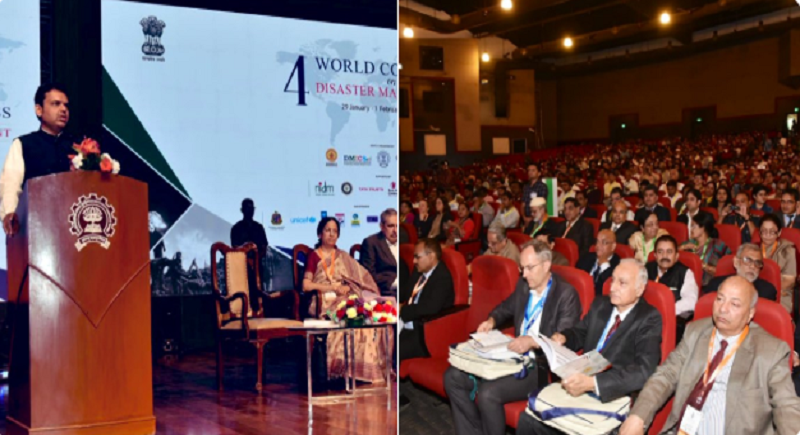 We are also working to reduce emission level by 2030 with various measures”, said Maharashtra Chief Minister Devendra Fadnavis while inaugurating the 4th World Congress on Disaster Management, WCDM-2019 at Mumbai. The event organised on Tuesday by Disaster Management Initiatives and Convergence Society, IIT Bombay, TISS in collaboration with the state government, was graced by Ministers Chandrakant Patil and Vinod Tawde with their presence. CM Devendra Fadnavis visited various stalls of disaster management equipments, instruments by over 70 companies or organisations including National Disaster Response Force. While demos were given to the CM, he interacted with many representatives. He also released a book with 450 research papers on this occasion. Fadnavis stressed on actions and preventive remedies before disasters occur and spoke on how schemes like Jalyukta Shivar has helped increase the agricultural production despite repeated droughts in Maharashtra. This scheme is also giving sustainable irrigation to farmers, he said. “I am confident that 4th World Congress on Disaster Management will deliberate in this direction & when we are sitting and brain storming in IIT, innovation is bound to happen! Let us all take an integrated approach than working in silos”, he said. Disaster Management Initiatives and Convergence Society (DMICS) is a civil society initiative, established in the year 2005. Registered under the ‘Societies Registration Act, Government of Andhra Pradesh’ this organization serves as a convergence society for decision makers, practitioners and experts on Disaster Risk Reduction. It aims to initiate innovative practices, ideas and thoughts by means of launching new projects, organizing global events on Disaster Management sharing best practices centering on the well being of humanity against natural and manmade disasters.